When the worlds of Ranger's Apprentice and Brotherband cross over, action and adventure are guaranteed! King Duncan of Araluen has an urgent mission for Hal and the Heron brotherband. One assassination attempt on his daughter Cassandra was foiled – but the would-be killers are from the deadly Scorpion cult, and they won’t be satisfied until they have completed their task. The Herons team up with Ranger Gilan to track the killers across the deserts of Arrida and infiltrate their mountain lair. 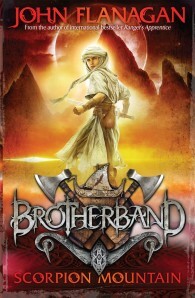 But the Scorpion assassins are not the only threat the brotherband will face. A seaside battle is looming, and the Herons are called upon to help an old friend of Araluen in his fight. With their forces split between searing land and treacherous seas, can the brotherband complete their mission – before the killers find their royal target?